The long-awaited decision on which company or companies will win contracts from NASA for the next phase of the agency’s commercial crew program can be expected by the end of this month, according to one report last night. NASA Comm. Crew CCtCap award likely on 22 or 29 Aug.: allows finalization of contracts before likely Contin. Res. (CR) for next FY at 1 Oct. The suggested dates raised some eyebrows: why announce on a Friday (particularly the latter date, which would be the Friday before the three-day Labor Day weekend?) However, such a decision would not be unprecedented: when NASA announced the Commercial Crew Integrated Capability (CCiCap) awards in August 2012, they also did so on a Friday—the Friday before NASA’s Curiosity Mars rover landed on the Red Planet! Also: CCtCap probably two "full" awards, no "half;" depending on $ avail., options to extend now/new active phases under consideration. NASA officials have not indicated a specific date for the CCtCap contract announcement, beyond that it would be in the “August-September” timeframe. “Our progress on commercial crew source selection deliberations has been evidently better than we anticipated,” NASA administrator Charles Bolden said in a presentation to the NASA Advisory Council July 30. He said that those awards would come “much sooner than later this year,” but was not more specific. 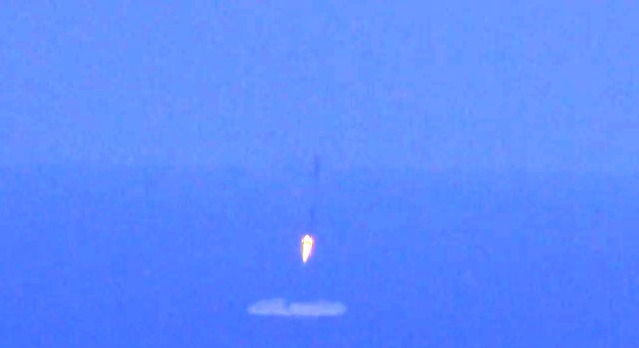 SpaceX released late Thursday a new video of the “landing” attempt of the Falcon 9 first stage after last month’s ORBCOMM launch. The video, taken from a chase plane, shows the first stage descending as it goes through “supersonic transition,” according to the video, then cuts to the relight of the first stage engines just above the ocean surface. Unfortunately, the stage slips from view just as the stage touches down on the ocean. “Plane camera with extra long lens loses sight of rocket just before splashdown,” the video explains. Early Tuesday morning, SpaceX performed the latest launch of its Falcon 9 v1.1 rocket, placing the AsiaSat 8 satellite into orbit. While the launch was originally scheduled for 1:25 am EDT (0525 GMT), a problem with the vehicle’s first stage—never explained in detail by SpaceX—pushed the launch back towards the end of an unusually long launch window. 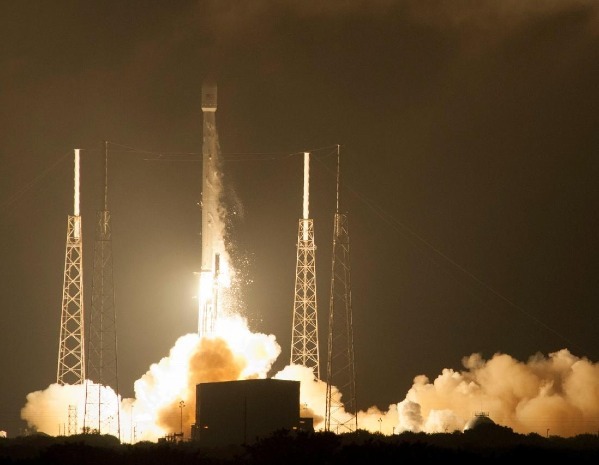 The problem was resolved, though, and the Falcon 9 lifted off at 4:00 am EDT (0800 GMT), releasing the AsiaSat 8 satellite into geostationary transfer orbit. High velocity reentry (2700 lbs/sqft) appeared to succeed, but, as expected, not enough propellant to land for this and the next mission. That launch took place less than a day after SpaceX confirmed it eventually shift commercial launches like this one from Texas. Gov. 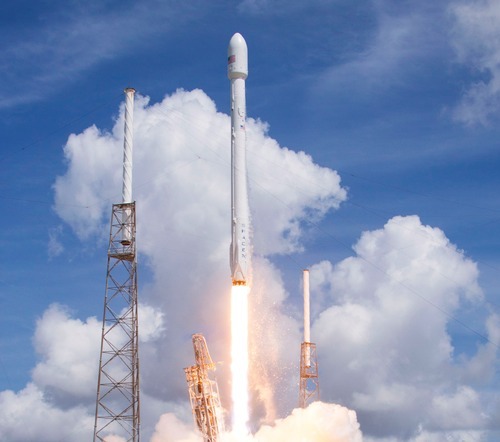 Rick Perry announced that SpaceX has agreed to build its planned commercial launch complex on the coast of the Gulf of Mexico east of Brownsville. That announcement was expected after the FAA completed an environmental review of the proposed spaceport and gave its OK last month for the project to proceed. Texas is providing a relatively modest amount of funding for the project: it will provide $2.3 million from the Texas Enteprise Fund, plus $13 million from a separate Spaceport Trust Fund to Cameron County to support infrastructure work needed for the spaceport. The release from Perry’s office cites “$85 million in capital investment into the local economy” from the spaceport, suggesting that SpaceX will provide the bulk of that funding for the project. 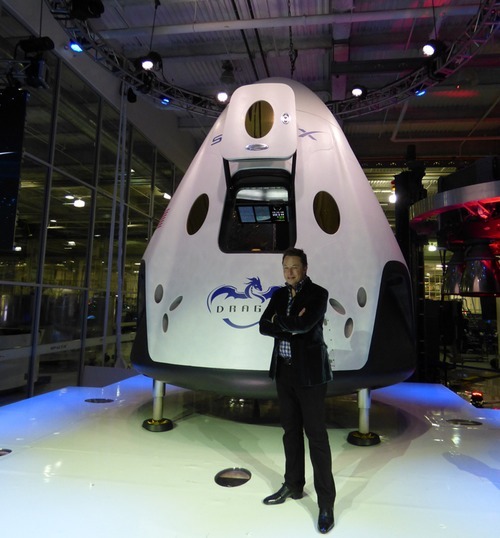 And there was a smaller development for SpaceX as well this week: a new landlord. Chambers Street Properties announced it was buying the building that serves as SpaceX’s headquarters in Hawthorne, California, for $46.7 million. SpaceX leases the building under an agreement that runs through January 2023, and there’s no indication that the sale would affect the company in any significant way. 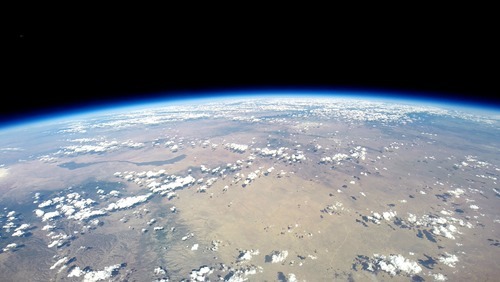 World View Enterprises, the company developing a commercial high-altitude balloon system to provide a flight experience like some aspects of spaceflight, has selected an initial group of research payloads that will fly on one of the company’s balloons as soon as this year, as the firm diversifies beyond tourism. The three experiments, announced in a company press release July 28, are a radiation measurement experiment by Space Environment Technologies, a meteor imager from the SETI Institute, and a student-built ozone monitor from the Florida Space Grant Consortium. The three are slated to fly in late 2014, according to the company. These three experiments will fly on the Tycho-800 balloon, which the company flew on its first test flight in mid-June. At that time, World View chief technology officer Taber MacCallum said the company had gotten early interest in using that balloon for technology demonstration and other research. 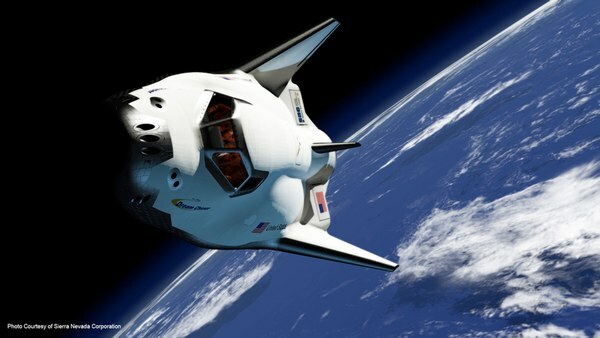 “It looks like that, early on, we could be in the business of doing experiments and test flights,” he said at the time. Stern said in his NewSpace speech that the company has also seen interest in using the balloons as commercial platforms beyond research and tourism. “In addition, there’s a very large interest that we’re seeing in something called ‘stratollites,'” which he defined as high-altitude balloons performing missions traditionally done by satellites, but at much lower costs. These applications could include both remote sensing and communications; in the latter case, companies like Facebook and Google have expressed interest in stratospheric platforms (balloons and UAVs) as a means of providing Internet access. For the first time in more than six months, Virgin Galactic’s SpaceShipTwo flew on Tuesday, albeit not under rocket power. The vehicle made its 29th glide flight, with pilots Michael Masucci and Pete Siebold at the controls. Virgin didn’t disclose the purpose of the flight beyond being part of the company’s overal test program. “As the world’s first commercial spaceline, we’re committed to conducting a thorough test flight program” for SS2 and its carrier aircraft, WhiteKnightTwo, the company said in a tweet. The flight was the first time SS2 flew since a glide flight on January 17, according to the flight test logs maintained by Scaled Composites. SS2 has made three powered test flights, most recently on January 10. Since then, the company has changed the fuel used in the hybrid rocket motor in SS2, switching from a rubber-based fuel to a nylon one. 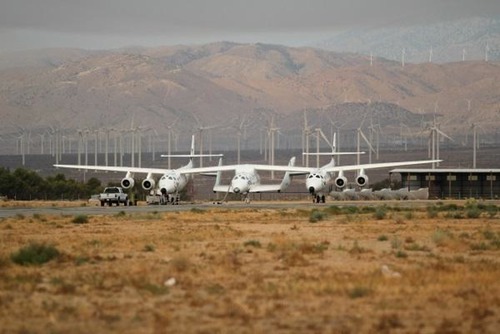 There have also been a couple personnel additions at Virgin Galactic and The Spaceship Company (TSC), the Virgin-owned venture that builds the vehicles. On July 24, Virgin announced it had hired a new pilot, Todd “Leif” Ericson, a former US Air Force test pilot. And on Wednesday, Virgin announced that former Scaled president Doug Shane is now the president of TSC. Shane joined TSC last year as executive vice president and general manager; the reason for the position change wasn’t indicated. The release offered one other item about Virgin’s efforts: work on the second SS2 vehicle is now “roughly 50%” complete. 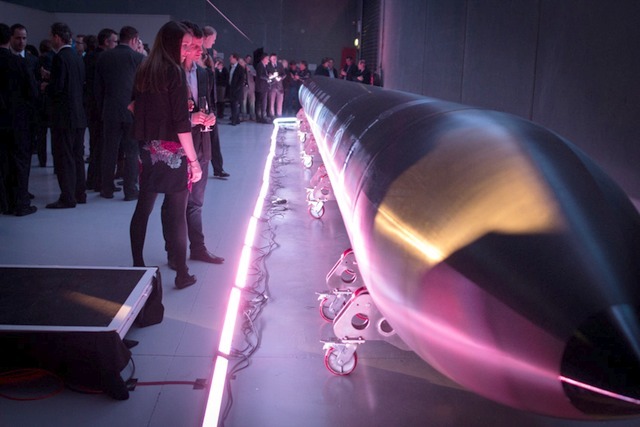 For the second year in a row, a company that seeks to develop an air-launch system for small satellites has won a business plan competition organized by the Space Frontier Foundation. CubeCab beat out six other companies in the competition held Thursday during the NewSpace 2014 conference in San Jose, California. The “Lightning Pitch” competition was a slimmed-down version of previous business plan competitions held by the organization, with companies required to give a four-minute pitch to judges, followed by a three-minute question-and-answer session. 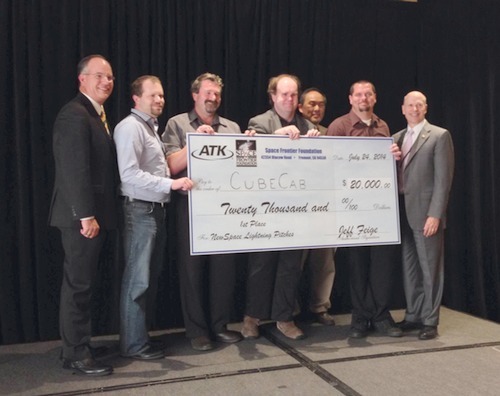 CubeCab won the $20,000 first prize by pitching an air launch system that can place individual CubeSats into orbit. The system would be able to place individual CubeSats into orbit on dedicated launches at the same price as current rideshare arrangements, where CubeSats fly as secondary payloads on larger launch vehicles: $100,000 for a 1U cubeSat and $250,000 for a 3U CubeSat. CubeCab disclosed few specifics about their air-launch design. 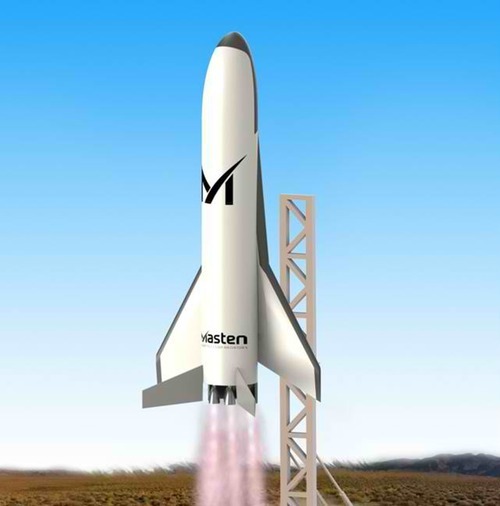 In his brief pitch, company CEO Adrian Tymes listed some technologies the system will incorporate, from room temperature self-pressurizing propellants to the use of 3-D printed components, but not a complete system architecture. “We’re still weighing the various options,” he said in a brief interview after winning the competition Thursday evening. CubeCab believes it can develop this system quite inexpensively. Tymes said in his presentation that the company is seeking $500,000 in a seed round and $4–5 million in a Series A round. That would be sufficient, he said, to develop the system, although he said the company might need a couple million dollars more to give it “runway” before revenue from launch services kicked in. The presentation, though, didn’t given the company time to break down its costs. CubeCab is the second air launch company in as many years to win first prize at a business competition run by the Foundation. Last year, when the organization ran a full-fledged business plan competition, Generation Orbit won first place. In this year’s competition, RockZip, a maker of high-altitude balloons, won second place at $7,500. Elysium Space, a company that plans to launch cremains into space inside CubeSats, won the $2,500 third prize.